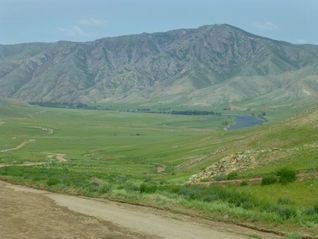 Large scale cropping as we drive to Darkhan in Mongolia before turning west. 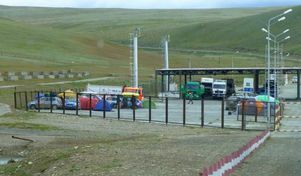 The border crossing back into Mongolia from Russia was a lot faster than when we went northbound. It still takes time as truck registration must be shown, sometimes ownership proven, forms in the native language have to be filled out with no English speakers to help, truck inspections done to check there are no hidden people or other illegal imports and then we have to show passports, visas and fill out more papers. All done and we head south to Darkhan and then west. What a treat for our 8.00am start. 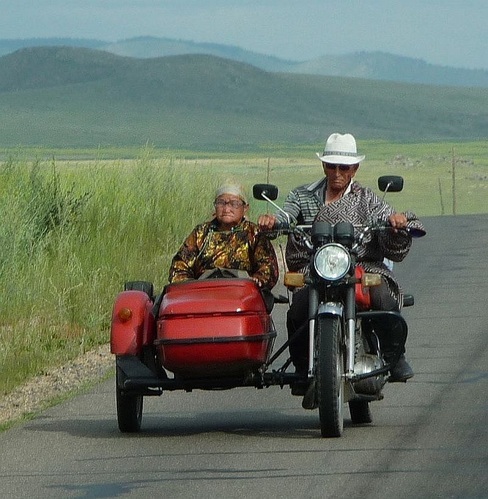 We saw an older Mongolian couple on their bike and side car. 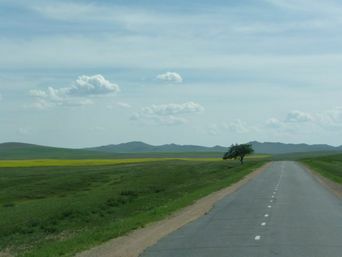 Travelled west through Erdenet which is the major regional town in Mongolia and the road was still sealed! We saw an open cut copper mine and also visited a carpet factory there before continuing our journey through wide open valleys and rolling hills of grass and some large scale cropping. Camped in a field of wildflowers. 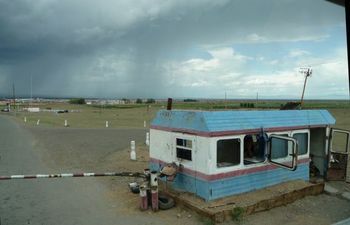 I never thought Mongolia would look like this. We stopped to watch several vultures for a while. The sealed road ran out and it was back to choosing and swapping tracks which were muddy after the rain last night. Local mechanic going through the options for a temporary fix to the spring. 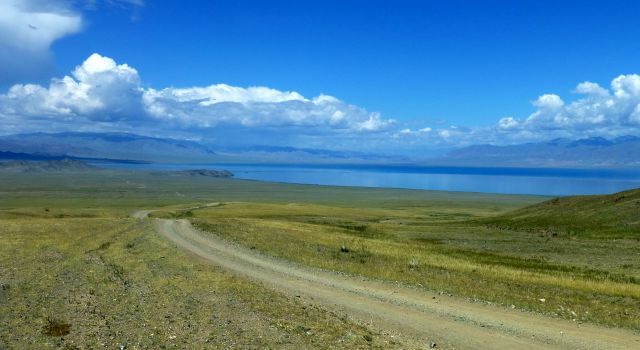 We arrive in Muren, stock up at the local supermarkets, (not much fresh fruit and vegetables) and then drive 100 kms north on the recently sealed road to Khatgal which is the jumping off point for the beautiful Lake Khovsgol area. After lunch we were just leaving town when the top spring on Rob's truck broke. The truck couldn't be driven any further. Fortunately a local mechanic and his assistant came out and worked for about 7 hours until after 9pm on a Friday night to get the truck moving again. 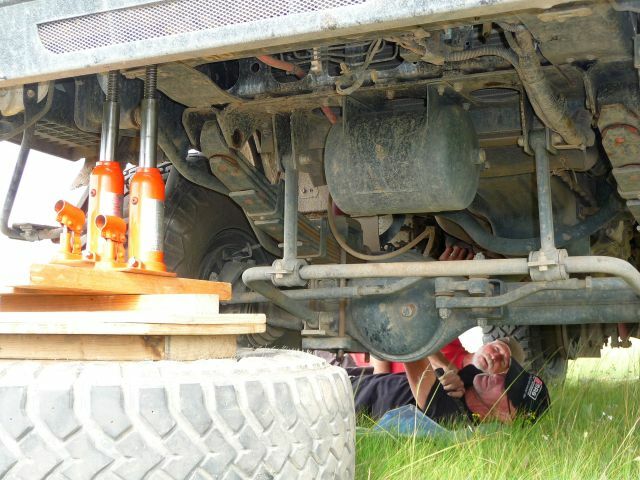 Miles measuring up a spare spring he had. Early morning view from our camp at Khatgal. Rob and Robyn decide to return to Muren to get/order a new spring. 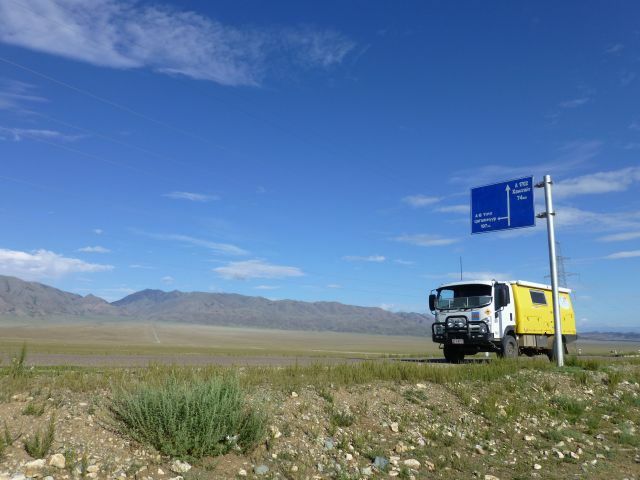 We continue on our way to Lake Khovsgol for a few days rest before returning to Muren. 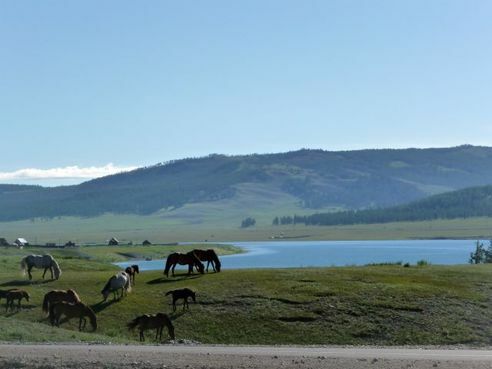 Lake Khovsgol was highlighted by sunny weather and a beautiful display of wildflowers. We spent the first night on the shore off the lake and the next three in a field overlooking the huge freshwater lake. One of 6 people trying to sell Guy "sheep". 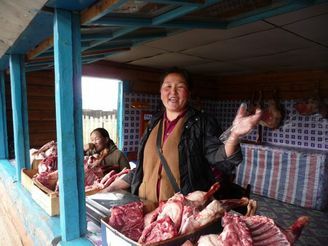 We left the lake and returned to Khatgal where we bought some meat and then back to Murun. Rob and Robyn will be in Murun a couple more days waiting for their spring but hopefully they will catch up to us soon. We will leave tomorrow although we have heard there is flooding in the rivers further west. Bronze age deer stone with stylised deer running skyward. 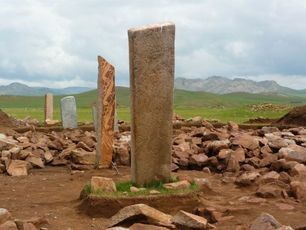 In the morning we went to the deer stones 20 kms west of Murun. The deer stones are 2500 - 4000 years old. It was believed that deer carried people to the afterlife. The stones often have a belt carved on them with axes, daggers and other useful tools hanging from the belt. We were very lucky to be shown around by a Russian archaeologist working on the site. Her English was also very good. 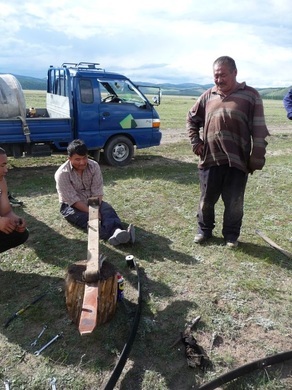 We returned to Murun, farewelled Rob and Robyn who are waiting for a replacement spring from Australia. We headed south before turning west for the 930 km drive to the Russian border. Not even 40 kms on the way and Miles top spring went. The road wasn't even bumpy where it happened. Fortunately he had a spare and so he and Guy set to work replacing it before dark! Work in progress as a rainbow circles Miles vehicle. Miles and Guy replacing the top spring. Scenery on a grand scale. 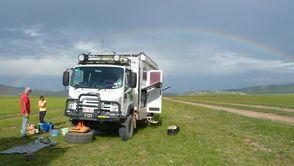 Scenic drive through large plains, a few mountainous areas, a beautiful stream, a pass around 1800m, more rolling hills and some passing showers. Some very muddy sections of the road but mostly rocky and dry. Top speed of 40 but usually under 30kph. Warm days but temperature down to 9C in the truck last night. 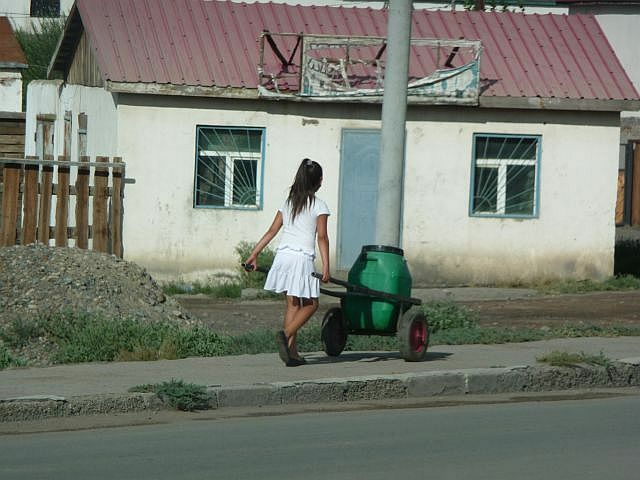 Drove into village of Tsetserleg where Miles spring was repaired. We had fresh, hot kurshuurs (fried pasty with a teaspoon of mutton mince inside). Back on the road and we met 3 separate groups of European travellers who were able to give us updates on a flooded river crossing further west. 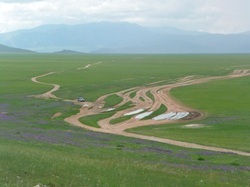 The countryside now included sand dunes and the mineral rich azure blue lake, Uvs Nuur. Tollgate into Ullangom - 1000 tugriks was the cost to us - about 85 cents. 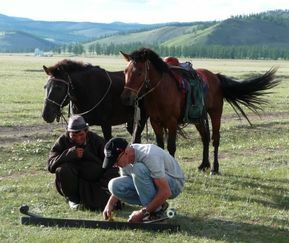 Our last days in Mongolia. We arrived in the last big town of Ullangom and replenished our fuel, food and water supplies as there were only small villages between Ullangom and the border. This is how water gets to most homes in Ullangom. Turn off to Uureg Nuur. The air is very clear and those mountains are a deceptive 10 kms away. Giving some shortbread-like biscuits to a herdsman. We were given some heavy looking shortbread biscuits a few days ago by some girls who ran out to us from their ger. They may have looked like shortbread but they were salty not sweet, and I am sure there was more than a little fermented mare's milk in them. Even the locals only break a little off at a time to eat. I managed to give them away to this shepherd. He'll be right till Christmas now. After driving over a pass, we descended to the clear waters of Uureg Nuur. Amazing that a lake of clear water surrounded by smooth stones and snowcapped mountains could be deserted during the summer season. Only had to share it with a few herds of horses, goats and sheep. It was cool but we still managed a quick swim. This guy owned all these horses. 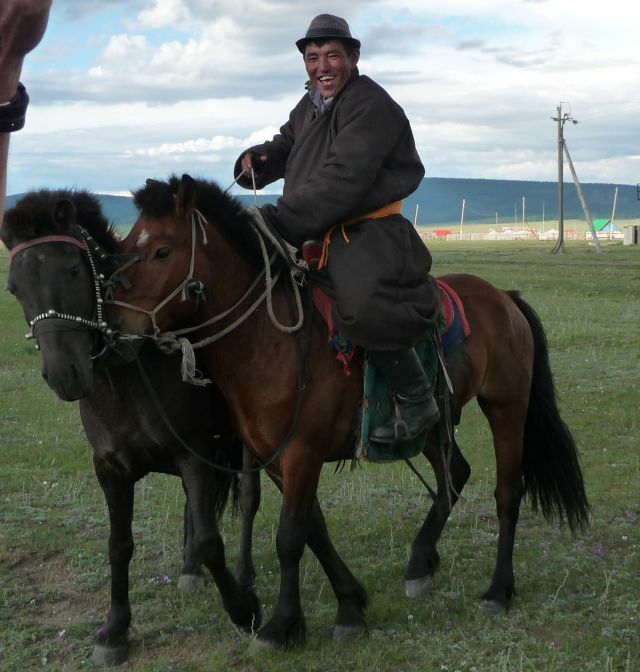 He showed us how he could lasoo one, change the saddle etc and ride it back to us. Very friendly. The goat alarm in action. 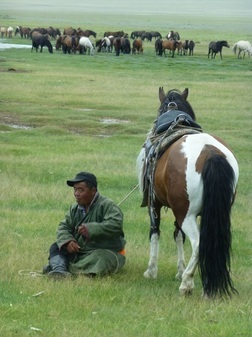 Relaxing time at Lake Uureg where we met a local herdsman and a not so nice drunken bike riding local. 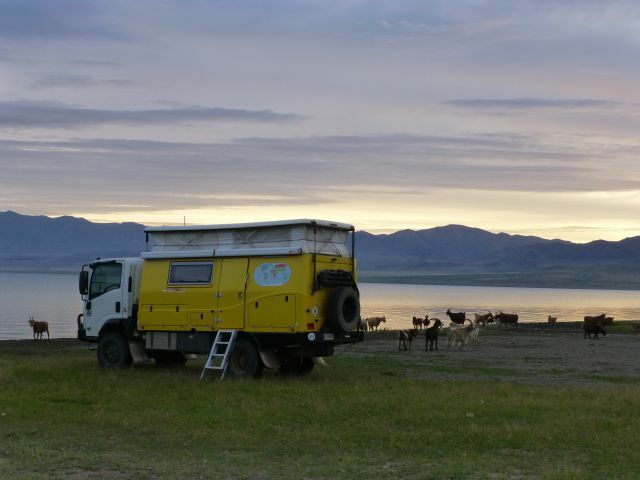 The goat alarm (goats rubbing their horns against the truck) sounded before 5am on our last day and so off to an early start for the river crossing. Lunar-like landscape prior to the river crossing 20 kms later. Those snowcapped mountains in the distance are more than 50 kms away. River crossing in the middle of a 50 km wide flat valley loaded with mosquitoes and march flies and watched over by snowcapped peaks. 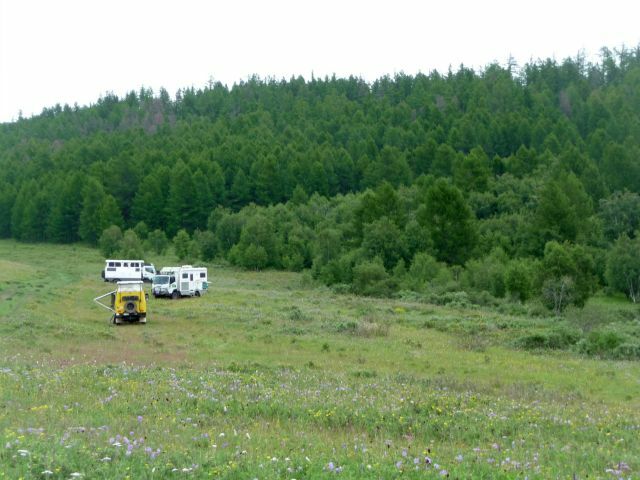 Rally car drivers stuck in no mans land for 3 days and counting. 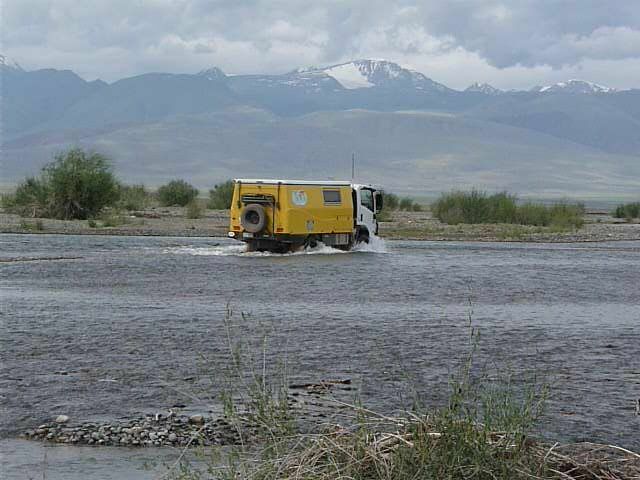 A very slow border crossing into Russia but at least we were not stuck at the border like these rally car drivers trying to get into Mongolia. They had been camped here 3 days in the cold and wind. Their vehicle papers were not as the authorities wanted.